The Venerable Pope Pius XII (Latin: Pius PP. XII; Italian: Pio XII), born Eugenio Maria Giuseppe Giovanni Pacelli (2 March 1876 – 9 October 1958), reigned as the 260th Pope, head of the Catholic Church and sovereign of Vatican City State, from 2 March 1939 until his death in 1958. Before election to the papacy, Pacelli served as secretary of the Department of Extraordinary Ecclesiastical Affairs, papal nuncio and Cardinal Secretary of State, in which capacity he worked to conclude treaties with European and Latin American nations, most notably the Reichskonkordat with Germany. His leadership of the Catholic Church during World War II remains the subject of continued historical controversy. 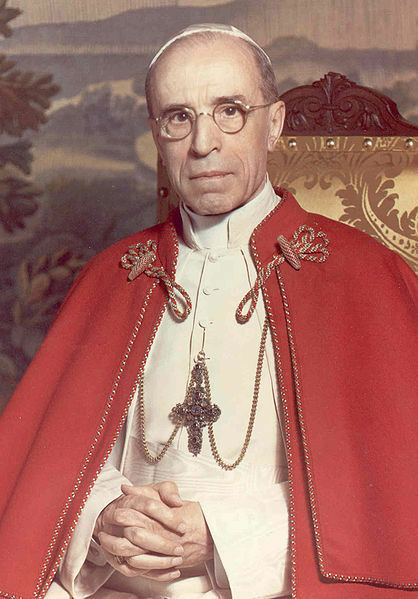 After the war, Pius XII contributed to the rebuilding of Europe, and advocated peace and reconciliation, including lenient policies toward vanquished nations and the unification of Europe. The Church, flourishing in the West, experienced severe persecution and mass deportations of Catholic clergy in the East. In light of his protests, and his involvement in the Italian elections of 1948, he became known as a staunch but pragmatic opponent of communism. He signed 30 concordats and diplomatic treaties. Pius XII explicitly invoked ex cathedra papal infallibility with the dogma of the Assumption of Mary in his 1950 Apostolic constitution Munificentissimus Deus. His magisterium includes almost 1,000 addresses and radio broadcasts. His forty-one encyclicals include Mystici Corporis, the Church as the Body of Christ; Mediator Dei on liturgy reform; Humani Generis on the Church's position on theology and evolution. He eliminated the Italian majority in the College of Cardinals in 1946. Pius XI died on 10 February 1939. Several historians have interpreted the conclave to choose his successor as facing a choice between a diplomatic or a spiritual candidate, and they view Pacelli's diplomatic experience, especially with Germany, as one of the deciding factors in his election on 2 March 1939, his 63rd birthday, after only one day of deliberation and three ballots. He was the first cardinal secretary of state to be elected Pope since Clement IX in 1667. He was also one of only two men known to have served as Camerlengo immediately prior to being elected as pope (the other being Pope Leo XIII). His coronation took place on 12 March 1939. Upon being elected pope he was also formally the Grand Master of the Equestrian Order of the Holy Sepulchre of Jerusalem, prefect of the Supreme Sacred Congregation of the Holy Office, prefect of the Sacred Congregation for the Oriental Churches and prefect of the Sacred Consistorial Congregation. There was however a Cardinal-Secretary to run these bodies on a day-to-day basis. Pacelli took the same papal name as his predecessor, a title used exclusively by Italian Popes. He was quoted as saying, "I call myself Pius; my whole life was under Popes with this name, but especially as a sign of gratitude towards Pius XI. "On 15 December 1937, during his last consistory, Pius XI strongly hinted to the cardinals that he expected Pacelli to be his successor, saying "He is in your midst." He had previously been quoted as saying: "When today the Pope dies, you’ll get another one tomorrow, because the Church continues. It would be a much bigger tragedy, if Cardinal Pacelli dies, because there is only one. I pray every day, God may send another one into one of our seminaries, but as of today, there is only one in this world." Pacelli was elected Pope on March 2, 1939, and took the name Pius XII. As Pope, he had three official positions. He was head of his church and was in direct communication with bishops everywhere. He was chief of state of the Vatican, with his own diplomatic corps. He was also the Bishop of Rome. In theory, at least, his views could influence 400 million Catholics, including those in all the occupied eastern territories - the Poles, Baltics, Croatians, Slovaks and others. As soon as he was appointed Pope, Pacelli did speak out against the 1938 Italian racial laws that dealt with mixed marriages and children of mixed marriages. However, he issued no such condemnation of Kristallnacht (the night of broken glass) which occurred in November 1938, and which recent evidence shows he was informed of by Berlin's papal nuncio. As the security of the Jewish population became more precarious, Pius XII did intervene the month he was elected Pope, March 1939, and obtained 3,000 visas to enter Brazil for European Jews who had been baptized and converted to Catholicism. Two-thirds of these were later revoked, however, because of "improper conduct," probably meaning that the Jews started practicing Judaism once in Brazil. At that time, the Pope did nothing to save practicing Jews. The Cardinals elected Eugenio Pacelli the 262nd Pope on his sixty-third birthday, March 2, 1939. He received sixty-one out of the sixty-two votes because he did not vote for himself, and was elected Pontiff. After serving the Church under four Popes (Leo XIII, St. Pius X, Benedict XV and Pius XI) for almost two decades, on March 2, 1939 Eugenio Pacelli took the name of Pius XII and was entrusted with the keys of supreme jurisdiction given to the Prince of the Apostles: "Thou art Peter and upon this rock I will build My Church" The bells of Saint Peter's pealed on March 12, 1939, as the eyes of countless people turned toward the balcony. 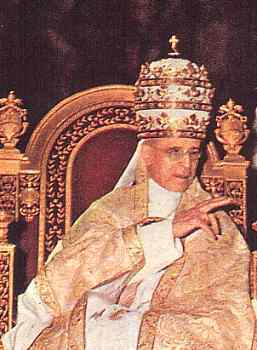 Dressed in a white cope and wearing a silver, gem-studded mitre on his head Pope Pius XII appeared. Cardinal Nicola Canali removed the mitre. Cardinal Camillo Caccia-Dominioni replaced it with the papal tiara and prayed: "Receive the tiara adorned with the three crowns and know that you are the Father of princes and kings, the Sovereign of the world, and the Vicar on earth of our Savior Jesus Christ, to Whom is honor and glory, now and forever. Amen."